This is the period of the mature work of the artist, who has long wanted to begin writing the winter forest, mysteriously bound by the cold and the cold. 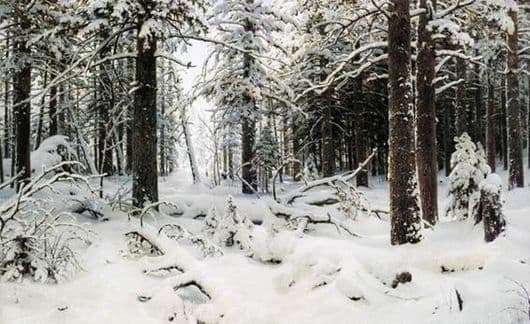 Shishkin painted this picture in 1890, in which he manages to convey the winter forest falling asleep under the snow with the help of white shades. He seemed to be petrified, frozen in a daze before the onset of heat and spring. And only powerful trunks of trees darken on a snow-white background. It can be seen that the snowfall has passed, so the branches hang down under the snow load. Amazingly their greatness, over which you can admire the clock. An impassable and dark forest combined with light and airy snow makes the viewer feel the full force of nature and the onset of cold weather. Young Christmas trees also lurked under a snow blanket. And only a small ray of the sun barely, barely penetrates through this thicket, into the realm of a small glade of a picture lurking in the foreground and colors it with the golden light of the sun’s rays. On the glade are broken trunks and branches of trees. Perhaps they collapsed, unable to withstand the severity of snow or natural elements. But the look rushes to a single gap, deepened in the picture among the whole darkness of the forest, filled with light – a clearing. Peace and quiet, beauty and dead, like a crystal snow-covered nature, all fell asleep around. There is no human or animal trail in the snow; this gives the picture the absence of any kind of life. The image is so real that, it seems, reach out only your hand and you can feel everything in reality. The picture is mysterious and mysterious, fabulous. And if it is better to look closely, then you can see that the author used a lot of grayish and yellow hues for the image, this gave her a kind of play of light. And the forest is not at all deserted. Here is a bird on one of the branches that lurks a gaze in the midst of a winter landscape.